Dumpsters4U is family owned and operated. We can handle all your trash removal needs. We will fit nicely into your dumpster budget. Since Dumpsters4U owns all of our equipment, we never overbook and we always arrive with in our 1 hour window. Dumpsters4U you is not a dumpster broker. You will work directly with our company and that allows us to meet all your needs. By providing up front pricing, you know exactly what you are paying for and there is never any back end charges. We do not advertise 'cheap dumpsters' just to get your attention or your business. We have been asked what kind of equipment we offer. Everything from trash dumpsters, trash containers or roll off containers, trash haulers and rental dumpsters to roll off dumpsters, rent a dumpster and waste dumpsters. Its pretty simple, we provide 10 yard and 20 yard dumpsters for all types of applications that may be needed. Everything from foreclosures and evictions to flood and water damage. Our service area is most of southeast Michigan. 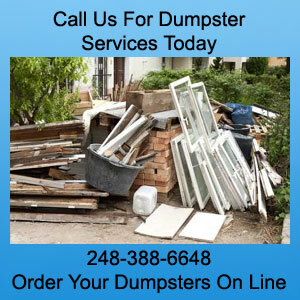 Including delivering dumpsters in Detroit, delivering dumpsters in Livonia, delivering dumpsters in Redford, delivering dumpsters in Farmington Hills and delivering dumpsters in White Lake. Contractors use our services commercial construction clean ups, basement clean outs, attic and garage clean outs and even carnival clean ups. Home owners use our service for any clean up needed in their house including remodels and home improvement clean ups. Whether you need our services for removing an debris from your home or construction site, for landscape clean up, kitchen or bath remodeling, commercial clean outs or any home improvements, Dumpsters4U should be your go to dumpster rental choice.